Zara Lyness, ‘It’s All About Me’ installation view, courtesy of the artist. Bells that won’t ring, bricks too fragile to construct with, clanking and smashing business cards. A white silence hanging opposite the view of construction sites and mountains on the other side of the large window. 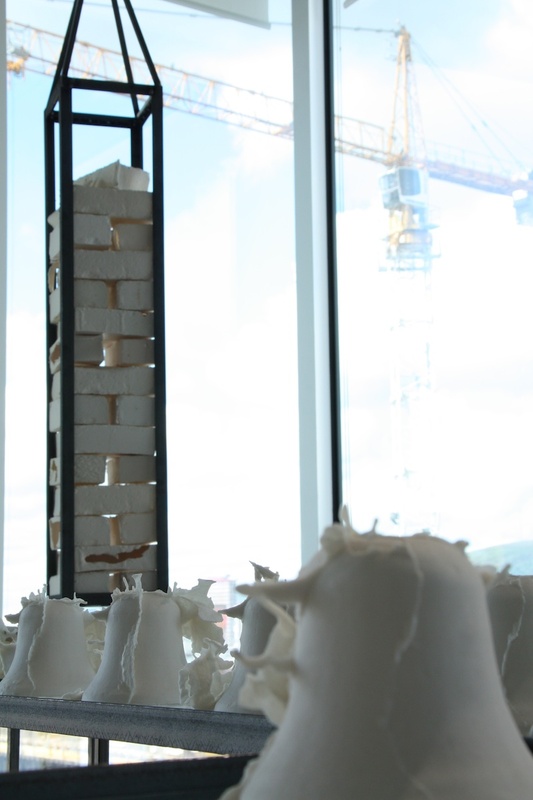 Zara Lyness’ space in the Belfast School of Art’s Fine Art Sculpture, Lens & Performance Degree Show was the first to be encountered on the sixth floor, and compelled a long pause in order to understand its silence. After I stood there for a while, taking in the white liquid simplicity of the porcelain, I reached for the box holding Lyness’ cards and jumped at the sound of smashing porcelain. I turned my head, a bit worried, luckily no one had heard it. 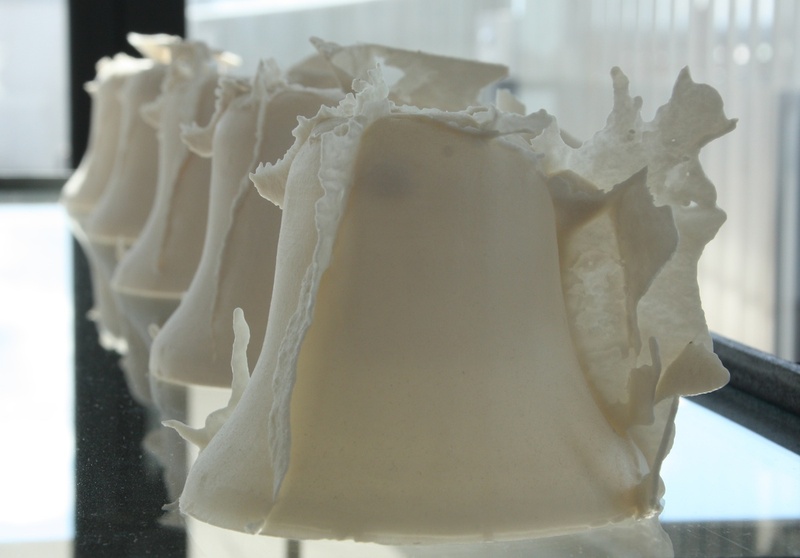 Embarrassed by my clumsiness I escaped to the next space, but I came back to look at the bells’ individual porcelain leaked seams, leaks that set them apart from carillon bells, tuned to specific notes. 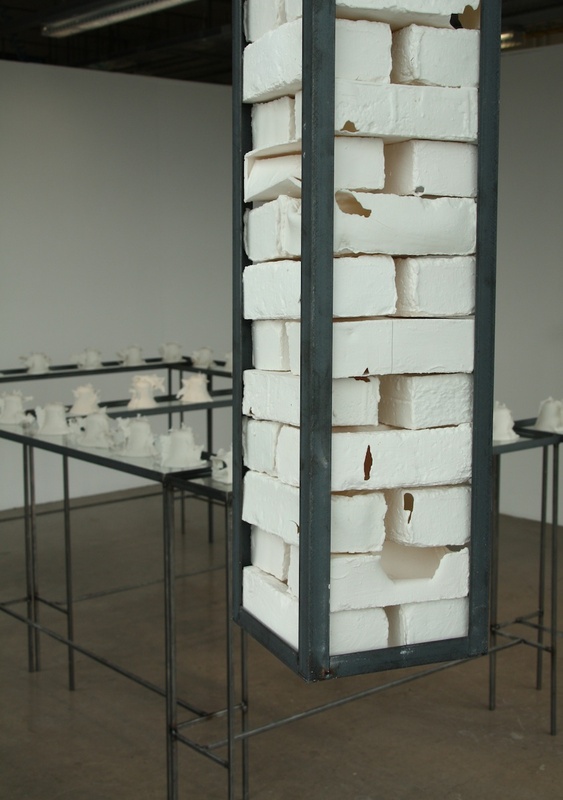 The arrangement of these bells, each with a unique response to the porcelain process, used the white space as a visual, tangible sheet music. This sense of tangible sound was further enhanced by the cage of hollow porcelain bricks hanging in the corner, fronting the construction site outside. 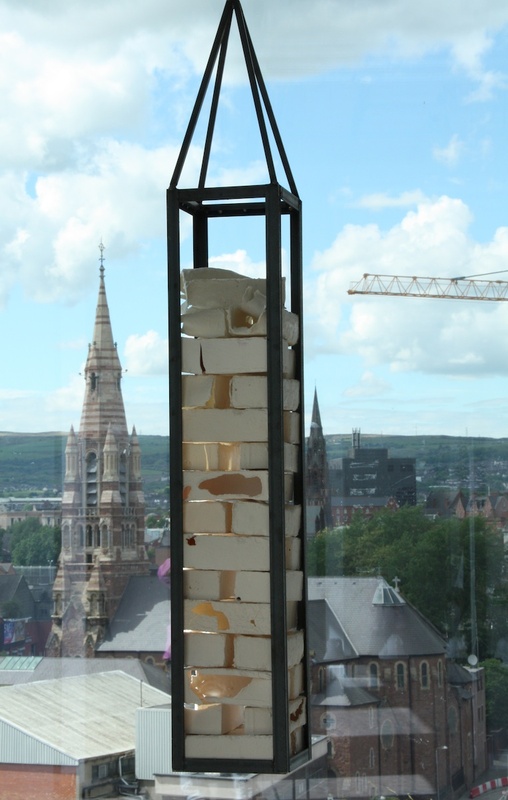 Two of the caged parian porcelain bricks were cast from the dust of the old Ulster University Art College building, the Orpheus Building. The work stood out due to the artist’s clear grasp of the position of her pieces in the space and in the context surrounding it. The white space was used as an amplifier to the individual objects, and the clever use of the porcelain printed business cards was a reminder of what the material feels and sounds like, breaking the silence occasionally, and curiously hinting at the intensity of what we cannot hear in this space. Moran Been-noon is an independent curator and artist based in Dublin.